I was contacted by the same people that contacted my sister in Christ Courtney. They are called my trending stories and I have been working on setting things up with them. My goal is to spread the word of God and strengthen the Christian community as much as possible and they are giving me a platform a bit larger so I can get the word out to more people, quicker and easier. I am working on starting my own website. I can be a bit costly but I am willing to put every last dime I have into this project because it means more to me than money. When you give all that you have for God He rewards your in heaven and blesses you abundantly here on earth. He provides all of the necessities and I literally have witnessed Him do so. I am working on making videos and editing them to accompany my blogs. People today don’t have much of an attention span so reading is pretty unattractive. Therefore they lean toward wanting to watch a video instead. So I bought some equipment and am going to start producing cool videos soon :-D! I have been working on a few guest posts for other people. I have one that will be posted on a site called married by his grace.com about marriage. I will possibly post it here as well but still head over to the site to support this woman she truly has a heart for God and is beyond encouraging to Christians that seek to spread the word. She helped me A LOT and I am positive that she can benefit you in a lot of ways when it comes to putting together your blogs and website. She writes blogs about how to set it up and everything. I have been spending a lot of time in the word and studying up on some apologetics. It is a faith exercise for myself because I basically reassure myself of why I believe in God and of how magnificently glorious He is! Lastly I have been working on planning a baby shower with my wife for our wonderful baby girl. I have the very last day of the 30 day blog challenge in the works and it should be posted soon. hahaha this took a lot more than thirty days but who cares lol. The 30th day asks me to write a letter to something. This one will be very special and near and dear so I am taking my time on it haha. I thought I would give you all an update as to what in the world I have been doing and why my frequency of publishing articles has been lacking. Thank you so much to those that are still tuning in and always remember to keep frogging it family (Fully Rely On God)!!! Lord bless you in all your endeavors, Julian! Julian I am so excited about all the things you are working on !! God is on the move and I see Him working in and through you SO exciting ! I think videos sound amazing and although it may seem like I have fallen off the face of the earth LOL I am still here and praying for you and your family. Great to hear from you again!!! I absolutely can not wait to see your next post! Hahaha I truly feel as though I have gained a true to life sister in Courtney lol I hope she continues to do great things. I am excited to do homeschooling and I know ahhaha it is so trendy today but it honestly is the only way to give a child a good Christian upbringing. Thank you so much for the encouragement and for the kind words hahaha. I am happy to be a brother to your family! hahahaha FROG all the way Joan <(did I spell that right) Lastly thank you so much for your prayers my goodness. There is nothing like having a community of people willing to pray for you. it is a beautiful trait to have to be willing to do so. God bless you and again I'm looking forward to that next post!!!!!!!!!! Awwwww Courtney feels like she is no longer an only child and has a “true” big brother and I guess that means she will be Aunt Courtney LOL LOL : ) and I am thankful that you are also my brother in Christ !!! Amazing how you can feel such ties with our brothers and sisters in Christ more so than blood relatives. Julian, we are so excited for you and Rebekah. You will be awesome parents and we are praying for the three of you every day. I agree with you completely your daughter will be blessed beyond measure being home schooled !! If I can offer any words of wisdom I am always here for you and your family. Congratulations on Trending Stories that is awesome – you are a great writer & as you continue to share Jesus you will bless so many !! LOL 😊 It is pronounced Joe-Anne ! No worries at all – Awwwwwww Courtney will LOVE being Aunt Courtney and yes we will definitely keep in touch and I am happy to answer any questions about home schooling – I love your daughter’s name Joelle that is beautiful ! I have been praying for Rebekah when is her due date? And a big YES absolutely you can post the Apologetic Blogs on your Trending Stories absolutely !! All credit can go to God ~ I am merely a messenger blessed with the knowledge that is His !!! And I could not agree more ~ people need to know that stuff for sure !!! Apologetics is often referred to as Pre – Evangelism because people need their questioned answered before they can hear the Gospel. Let me know when and where you are posting your Video Blog – the one Courtney showed me was awesome !! 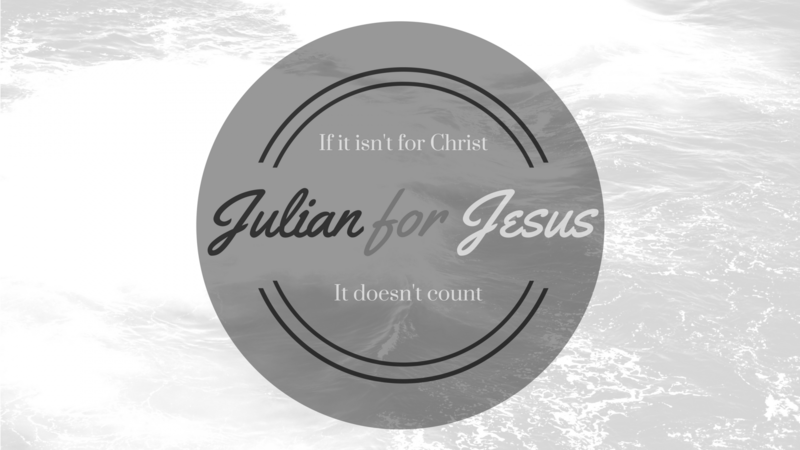 God bless you and yours Julian ~ praying for all the things God has placed on your heart !! You are definitely a soul on fire for God !!! God bless you and thank you again for being an awesome Big Brother to Courtney !! Hahahaha I’ve been saying Jone all this time Lol I see the apologetics post and am definitely going to reblog it. awesome of you to keep up with this despite your busy busy schedule. I just listened to the sermon that Courtney sent me. I was absolutely intrigued with the entire thing lol. I love that he is teaching on creation and mentioned a little bit about the difference between our belief and Atheist scientist beliefs. I always say “In the beginning I believe there was a God, You believe in the beginning there was matter. Therefore your creator is matter??? Huh?” hahaha I literally used that line all the time. I will definitely keep up with his sermons now that I have the website. No need to thank me for being a great big brother to Courtner btw shes a great girl and you raised her right. kudos to you and your husband for doing such an amazing Job bringing her up the right way. I hope that my daughter will have a love for Christ as she does. Hopefully an even larger amount of love. I am workign on writing material for the videos so my blogs will be a little bit spotty hahaha this video thing is harder than it looks hhahaha. But thank you so much for tuning in and keeping up with us and my gosh I can not thank you enough for lending me your wisdom on homeschooling. If your not around keeping in touch in 4 years we might be lost hahahaha. LOL : ) My were going to name me Jennifer would have been much easier huh ?? Thank you so much for your very gracious compliments about Courtney – I am humbled and appreciate your words immensely – however I praise God He created her with so many gifts and talents and she uses them for His glory ~ it is amazing. Joelle will LOVE Christ & will have a passion to live for Him just like her parents. Excited to see the videos ! They will be awesome and God will use them to reach so many people !! I told Courtney to give you my email address for Apologetic and Homeschool questions … Courtney asked me to guest post and she asked me to write about Wisdom so I am sure she will be posting that soon – I know you are doing one too : ) for her !! so blessed to be one family in Christ with you all ! Congratulations on getting a job/gig with My Trending Stories! That’s super exciting, as is the video, website, baby shower, and all the other awesome things going on in your life! Also, I can’t wait to read the guest posts…especially the one for my blog! 😂 I’m sure that whatever you write about will be exactly what someone will need to hear. The cool thing about guest posting is that you get so many different perspectives/personalities. I’m sure you have a lot that you could add to 1 Timothy 4:12 Girl. Lillian would be a great name but my cousin already named his child Lillian hahaha. Thank you so much Courts for the supports hahahaha I would totally invite your family to the baby shower but you prob live way too far away lol!!! I am working on your guest post as well I will send you a msg on instagram about what its about tomorrow. And you are so true about guest posting I loving doing it and also it gets your message out to a totally different audience that may have never looked to see what you were about otherwise. I gathered like 15 followers from guest posting on one womans website so it helps a bunch and it spreads the word. Hahaha I can not wait to share the stories about my experiences with them goodness. by then I will probably have the video thing rolling though hahaha. That should be super exciting!!! Previous Previous post: 30 day blog challenge day 29: someone who inspires me. Next Next post: Two kinds of bread. A sermon by Pastor Jim Cymbala.